Aurora Expeditions is looking to double its customers from the UK following the appointment of a dedicated sales representative in-market and planned arrival of a second ship. Speaking to TTG in London, Michael Woods, brand marketing manager for the Australian company, said he was excited for the UK’s potential. Craig Upshall starts in April as sales director UK and Europe, from a 20-year background with Rocky Mountaineer, Royal Caribbean, Island Cruises and American Airlines. To be named the Greg Mortimer – after the company’s founder, who was also the first Australian to summit Everest without oxygen – Aurora’s second vessel will herald several firsts in the world of expedition cruising. It will be the first leisure expedition ship to use the patented Ulstein X-Bow technology, which operates with an inverted bow making it much more stable and less subject to vertical motions induced by waves. This will be particularly relevant for crossing the notorious Drake’s Passage across to Antarctica, which will also be shortened on the new ship. As well as improving the comfort of the crossing, the new technology also allows for a reduction in fuel consumption and air emissions. Virtual anchoring and satellite geo-positioning will also mean the ship can remain stationary while anchorless, leaving the delicate sea floor undisturbed. The 104-metre ship will also feature a 360-degree open viewing deck and indoor passenger lounge with panoramic windows with unobstructed 180-degree views. The Greg Mortimer will also offer the first-ever hydraulic side viewing platforms, which will mean passengers can see wildlife at much closer range. The ship will have a sea-level activity platform at the stern too, where there will be four rear exit points from a dedicated ‘Mud Room’ for guests’ outdoor clothes and equipment, as well as quick access to 15 Zodiacs for excursions. “Not only will this ship adhere to our high environmental standards, it will make for a much smoother journey all-round, and give our guests a much more connected experience,” said Woods. The Greg Mortimer will take more than twice the number of passengers as Aurora's current ship. There will be 160-passenger capacity and 80% of cabins will have private balconies; however on Antarctic sailings there will only ever be 120 guests, as regulations only allow for 100 passengers to be on-shore at any one time. For those still cautious about the Antarctic crossing – or more time-conscious – Aurora Expeditions is also launching a Fly/Fly and Fly/Sail option, with direct flights between Punta Arenas and King George Island across Drake’s Passage. 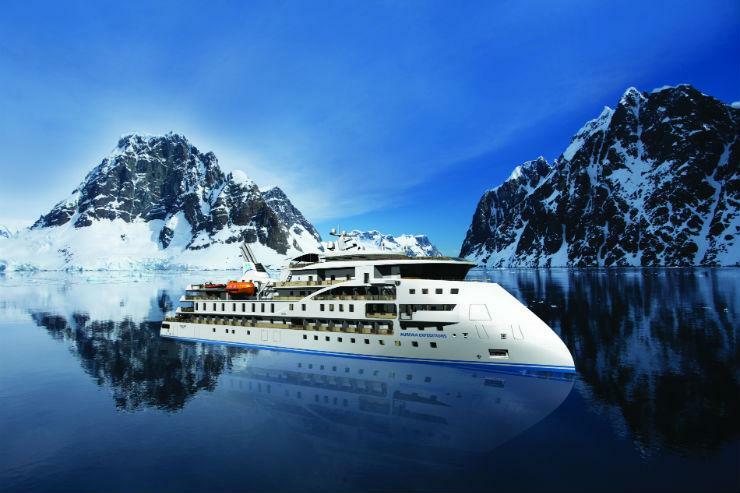 Currently being built in Shanghai for Aurora Expeditions by Sunstone, the vessel should be ready by August or September next year, embarking on its maiden voyage on October 31, Spirit of Antarctica, with an Arctic season from June 2020. New Arctic cruises for 2020 will include the Franz Josef Land Explorer in July. Embarking and disembarking in Longyearbyen, it will be the first time the company has explored the 191-island archipelago of Franz Josef Land and includes eight days in the Russian Arctic national park. Also new will be the High Arctic Adventurer, also sailing in July 2020 and combining Svalbard Odyssey and Franz Josef Land Explorer in one sailing, offering a complete exploration of the High Arctic, during the 24-hour daylight of summer. The new Arctic Discovery expedition (August 31-September 20) will sail from Longyearbyen to Bergen, pushing through pack ice through the Greenland Sea towards East Greenland national park, and the world's largest fjord system, Scoresbysund. The sailing will also include an attempted landing at Jan Mayen, the northernmost island on the mid-Atlantic rift, one of earth’s most remote islands. Also new for 2018 will be “Pole to Pole” itineraries from July, allowing people to go around the world “the other way” should they wish to stay on-board the whole time. “We’re seeing a real polarisation now between what we would see as the high-end pleasure cruiser in expeditionary areas, and those ships – such as ours – which are specifically designed for the expeditionary voyager,” added Woods.